The first system built specifically for processing the popular new “pouch” photopolymer materials. 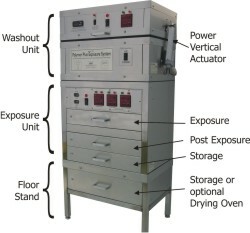 The exposure unit and washout unit are separate machines that work independently of each other. With the addition of the floor stand, the exposure and washout units can be stacked as a complete system requiring little floor space and providing easy access to all system components. A specially designed clamping system and precision ground bearer bars secure the glass plates over and under the polymer pouch. This is essential in properly processing the plate. The system is also suitable for processing liquid photopolymer resin and negative film material with use of our Foam Exposure Pad. A total of sixteen 15-watt UV tubes expose from the top and bottom of the glass for uniform and consistent exposure. Each tube is fired by its own rapid start ballast. Tube usage hour meters are built into the machine for each bank of light tubes so you can monitor UV tube life and anticipate the need to replace lamps. Easy access to the UV tubes is provided through the back of the machine, without the need for tools. Separate timers control the face exposure, back exposure and post exposure cycles. Processing times are retained within the timers for simple, efficient and user-friendly operation. The post-exposure compartment has a deep water container with a sealed glass lid to prevent splashing of the post-exposure solution. 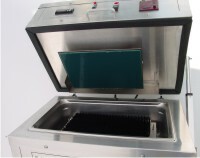 A “shutter” covers the glass lid to minimize UV light bounce within the machine. A utility drawer is built in for storage of processing supplies. All drawers are built on ball-bearing slides for efficient function and long life. 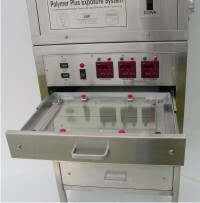 Count on this machine to thoroughly and completely wash unexposed residue from your pouch polymer, liquid resin and metal backed polymer plates! The orbit plate alternates between clockwise and counterclockwise movement to wash evenly. The height of the 9½” x 14” nylon brush block is easily adjusted. The lid is opened with a power vertical actuator so opening and closing the unit is accomplished with the flick of a switch. No other machine in the industry offers this feature! A shut off valve with hose fitting is connected to the bottom of the tank and protrudes from the back of the machine for efficient filling and draining of washout solution. 850 watts of heating power are attached underneath the tank to quickly bring the washout solution up to operating temperature. An electronic digital temperature controller is used to maintain proper water temperature and a digital timer with memory is used to control the length of the washout cycle. Machine is equipped with ground fault circuit interrupter (GFCI) for safe operation. Specifically designed to compliment and add utility to the system. When the system is stacked on the floor stand a minimum of floor space is used and the controls are at the proper working height for most people. Electrically welded stainless steel tubing for strength. Adjustable leveling pads compensate for variations in the floor height. The large utility drawer provides valuable storage space for negatives, plates and other materials. 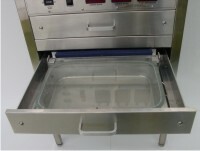 Optionally the drawer can contain a convection oven to blow a steady stream of warm air over hard polymer plates for proper curing. All stainless steel construction for all system components. Made in USA with quality American made parts throughout. 1-year limited warranty. Cannot be shipped by UPS -- must be shipped by motor freight and we will advise the cost of freight accordingly. Also available for operation on 240 vac, 50 Hz. The easiest way to process liquid photopolymer!